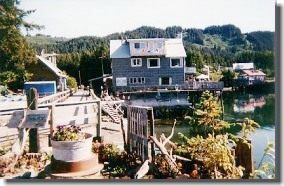 Seldovia Rowing Club Bed and Breakfast, the first B&B in South Central Alaska, provides a unique, Alaskan experience not to be missed when you stay in secluded Seldovia, where the hospitality has been preserved for generations. Enjoy panoramic views of the tide’s many changing attitudes, the gourmet breakfast, and Owner\Artist’s Stairway Gallery, with A Touch of Glass, on the premises. 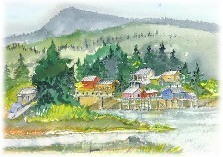 This watercolor is an original by Susan Mumma, owner of Seldovia Rowing Club Bed and Breakfast which is located on the historic Seldovia Boardwalk. Your resident hostess and owner, Susan Mumma has decorated the bedrooms in a nautical Victorian style, adding to the wonderful flavor of the area. She will be pleased to show you her garden and point out the comical sea otters often seen playing nearby. 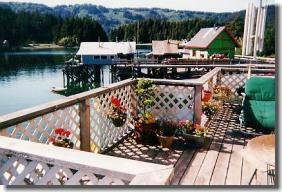 Or maybe you’d like to have a morning cup of coffee on one of the decks overlooking the bay. 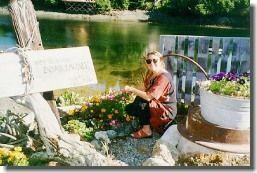 Whatever your preference we’re certain you’ll thoroughly enjoy your stay in Seldovia at Seldovia ROWING CLUB Bed & Breakfast. Rates are $130 per night for a room. Just send an email or call to check for availability. I’m Susan Mumma. They tell me it’s a mistake to have so many pictures on a page but words alone just can’t do justice to how beautiful it is here. This is our lovely home looking at it from the slough at high tide. I hope you’ll stop by and say hello while you’re in Seldovia. Better yet, let us know when you’re coming and we’ll reserve a room for you.